Being one of the largest companies in the global gambling market, Sporting bet was founded in 1997. Is one of the most important company from England and probably one of the most important bookmaker of the world. This bookmaker is forced on the used market, but it’s not the case anymore, as the laws that regulate online gambling in the United Stats have overly tightened this industry. On the other hand that was very good for European customers. 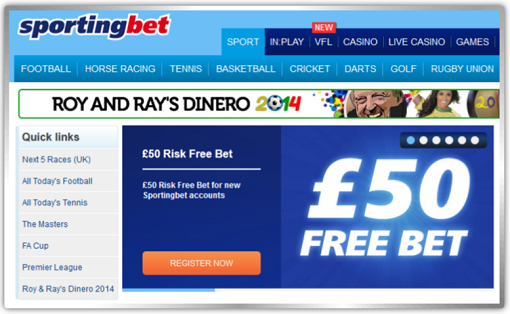 With over 2 millions accounts registered, SportingBet is probably in the top of a user’s preferences. Like every important bookmaker of this world, SportingBet has a very developed support system which can help the users whenever they need to solve a problem. They can talk to the users by live chat, via email, by Freephone, contact form or by fax. By this point of view, SportingBet is a very important bookmaker, the support system is very well created and the bettors are satisfied about it. They support many languages like: French, English, Spanish, Italian, German, Romanian, Bulgarian, Slovak, Czech, Swedish, etc. Whenever you have a problem, the operators are online and they really help you to solve it, so, don’t hesitate and ask them whenever you need. To attract the people, SportingBet offers a welcome which is really high and good valued, it is the free bet offer on the first deposit up to £50. If you lose your first bet and it isn’t more than £50, the money will be refunded to your account. Also, they provide a lot of local offers, so the best thing is to visit the site and check for your country. To be able to claim your welcome bonus, you must register and make his first deposit. The first bet must be made within seven days after upon the registration. The only requirement is that the minimum odd is equal or higher than 1.50. If the first bet loses the player can recover the amount of the first bet within 48 hours from the moment of betting. The refund comes in the Freebet form and can be used on all kinds of bets where the minimum odd is equal or higher than 1.50, this is the most important rules which must be respected by all the new bettors. Also, if you are from Australia, SportingBet provide a very attractive bonus, to be able to know how to claim it, you must access the website and ask for it. Because they need to attract many gamblers, special events are very valuable and it must be admitted that there are a lot of offers for existing customers. For the active users, SportingBet has an important Bonus Club, where clients collect points which are linked to turnover and depending on the number of earned points players get various prizes and extra bonuses. Also, because they are one of the best, by the bonus point of view, probably SportingBet really know how to keep close the bettors. They provide permanent and special actions and bonuses. In addition to this action there is a variety of other very interesting actions which are constantly changed. For the high rollers there is a Premium Club where a completely different world starts, where exclusive VIP tickets for sporting events are offered, alongside the surprises for holidays and birthdays. If you are a new user at SportingBet Deposit options at Sportingbet by the following methods: Visa, MasterCard, Neteller, Click2Pay, Skrill, Giropay, Paysafecard, Ukash, PayPal and Bank Transfer. To withdraw your money you can use the same like at deposit Credit Card, Neteller, Click2Pay, Skrill PayPal and of course Bank Transfer. SportingBet has a very huge list with betting possibilities, the standard set by large European bookmakers. The company tries to cover all leagues and the most important competition of the European football. From SportingBet offers, are missing fifth leagues of the world, but surely it isn’t a big problem because the bettors don’t bet on these matches, there are plenty of special bets, which are offered for almost all sport events. They are not the best from the odds point of view, but they come with attractive odds and sometimes they are the best. Of course, the selection of live bets has been vastly expanded and now live bets are available at any moment. Like every important bookmaker, SportingBet offers a complete gambling package with: live betting, casino, poker, casino, live casino, games, more and more. Another special feature is the mobile offer. Also, SportingBet offers a real app, not just a mobile version of its website, as it is the case with most of other bookmakers. The advantage of a real app is of course the speed, but more important is the increased security level for the end user. Probably today, the mobile devices are greatly used by the users and the app is very important. In conclusion, SportingBet is strongly one of the best bookmaker of the world with a great support system and of course more bonuses for all the bettors. Every day a lot of people come online on their website and win a lot of money. If you are interested to try SportingBet services and their attractive odds, don’t hesitate and register a new account. Profit about their welcome bonus and place your first bet up to £50, in case you lose it, the money will be refunded to your account, in case of win you will be very happy and you will get of course all the money. Start betting at SportingBet, win money and get experience with this important bookmaker, start betting and if you want to recommend to your friends, together you can collect more money. Also, SportingBet provides more affiliate offers, you can try it and surely these offers could help you to win a lot of money if you’re a webmaster.